Do search term numbers matter? Summary: Yes. But extinction can probably catch up if we put our minds to it. "There are more academic papers on dung beetles than the fate of H. sapiens," Sandberg writes. That’s a bizarre state of affairs. What’s going on? Mitigating risks requires more careful and thoughtful development of new technology, measures to avoid deployment of unsafe systems, and international coordination to enforce agreements that reduce risk. All of those are uphill battles. No wonder it’s more rewarding to study dung beetles. I&apos;m often suspicious of claims about the state of the world (e.g. the resources devoted to different academic subjects) based on imperfect signals about the state of the world (e.g. search results for paper topics). "A Google search for X returns Y results" is a lazy cliche, almost totally uninformative in most places I&apos;ve seen it used. "Google auto-completes X with Y" isn&apos;t much better. I&apos;m too lazy to register for Scopus right now, but Google Scholar gives me similar results for 2012. For the rest of this post, I&apos;ll use "since 2018" as my base year, rather than 2012 -- with EA&apos;s influence, maybe X-risk is catching up to beetles? Data collected on 4 February, 2019. Okay, the beetles are winning. What if I add a some of the natural threats to humanity mentioned by Sandberg and Piper? Is this a decisive victory? A "dung deal", as it were? I tried removing "global" from "global catastrophic risk" and almost beat the beetles, but I discovered that "catastrophic risk" is insurance lingo which usually refers to hurricanes and droughts and other non-global hazards. I tried adding "mass extinction" and more than doubled the beetles&apos; score, but nearly all papers using that term are about natural history rather than future risk. I tried removing "include citations?" for my searches. This cut down on beetle numbers (from 1830 to 1080) and didn&apos;t really affect my longest X-risk search term. Suddenly, risk came out ahead! The psychology concept of "human extinction learning". "Human extinction of" other animals (the real X-risk was inside us all along). Random physics papers summoned by my reckless use of gamma rays. ...and so on. Take out all of that, and the beetles are still pushing us around. More people are currently being paid to study biological topics to which dung beetles are relevant than to study human extinction. It&apos;s easier to publish papers about said topics than about human extinction. How much work/investment goes toward each topic, in total. 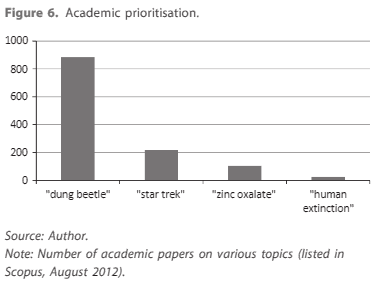 People working outside the scientific community, including governments, probably spend a lot more money and time on human extinction than they do on dung beetles. How easy it is to get involved in human extinction research compared to dung beetle research. The former could be a vast field with innumerable open questions, but it still seems difficult for most people to contribute in any reliable way; few of those open questions are listed anywhere, few classes teach these subjects, few reliable methods exist for making progress, etc. By contrast, if you are a college student and want to start studying dung beetles, you can grab some bug traps, follow your professors to a nearby national park, and start taking samples. ...I suppose it&apos;s time for me to start soliciting lists of open questions. That post will be linked here in about 15 minutes. Please let me know if I missed anything, of course, from a more apt search term to a philosophical consideration. It would be nice to take the Dung Beetle Question from "open" to "closed".